MY APOLOGIES, THERE ARE NO CLASSES AT THE MOMENT. Learn how to paint and create astonishing paintings and mixed media pieces using the finest paint, fine art papers, pigments and texturing media. 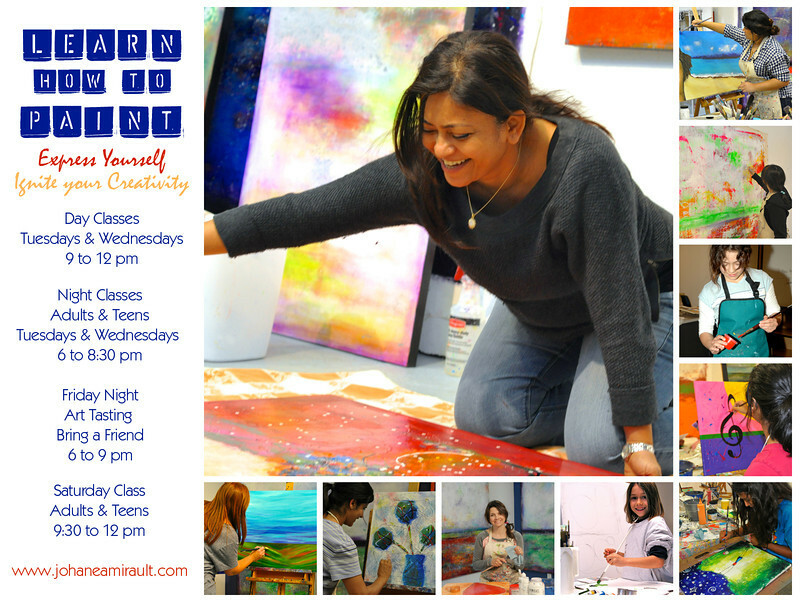 In these classes, adults, teens and children learn the technique of working with acrylic while working on a project. Student learn how to glaze and varnish to create extraordinary luminosity. Students choose to paint from a photograph, or to study the work of another master artist. Hundreds of images are available at the studio. Students can choose also to paint intuitively and create stunning abstracts. Classes are limited to 6 to 8 students. Students must purchase the basic art material. I will be sharing my supply too to allow you to discover different colors, blending and texturing media. To see the work of the students, older and young, visit the Student'Gallery.